TECUN UNAM, Guatemala – It’s just a 15-minute walk across the bridge separating Guatemala and Mexico. Now, this concrete stretch has become the scene of an unfolding humanitarian crisis as around 1,500 mostly Honduran migrants — many of them children — are sleeping here amid heaps of garbage with no bathrooms and no water except for what volunteers bring in small plastic bags. At the moment, this is the end of the line for nearly half of the estimated 4,000 migrants mostly from Honduras, part of a human “caravan” headed ultimately for the U.S. border. Mexican federal police fired tear gas Friday to prevent an onslaught of migrants from storming the gates; now, the crowd has settled down and appear ready to wait here as long as it takes to get across the border. “The municipality is collapsing because of the quantity of people here,” said Gustavo Adolfo Arana Jui with Guatemala’s natural disaster commission (known as Conred), in a press conference Saturday in Tecun Uman, where the migrants have converged. In an effort to alleviate the crisis, the Guatemalan government is sending buses to Tecun Uman to offer free transport for Hondurans who want to return home. Guatemalan President Jimmy Morales said on Saturday around 2,000 members of the caravan have gone back to Honduras. Municipal officials in Tecun Unam pegged the number of returnees far lower — at around 1,200. Meanwhile, more than 1,400 migrants from the caravan have entered Mexico in the last week, according to estimates from Mexican government officials and shelters operating in the region. 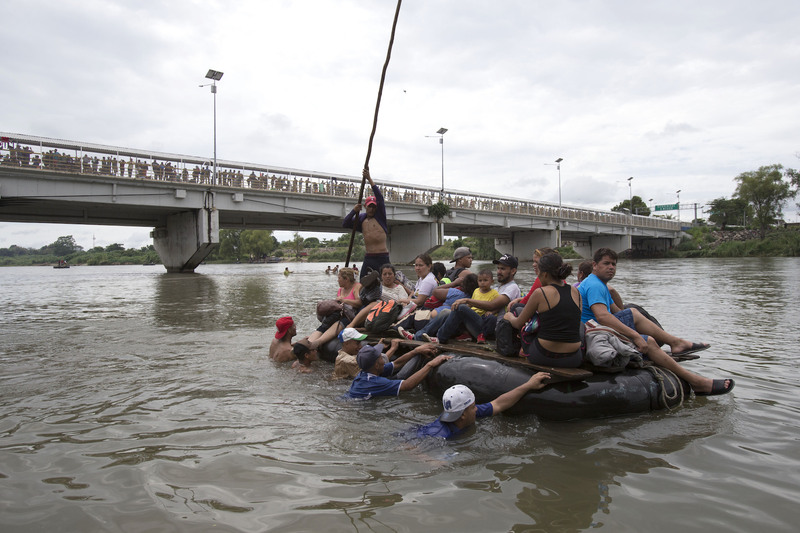 Some were granted legal entry by Mexico, although the majority appears to have crossed into the country illegally, crossing the Suchiate River on makeshift rafts. But the bulk of the migrants who joined the caravan are now living in makeshift camps on a bridge less than a mile long. Some are sleeping under tarps, but most have nothing to protect them from the rain and sweltering sun. And with no trash cans, trash heaps line the bridge, despite efforts by Guatemalan volunteers and the migrants themselves to keep the area clean. Still, most of the migrants say they plan to stay as long as they need to – even those with children. Mejilla, who wants to find work in Mexico or the United States, doesn’t have a plan for what’s next. She has thought about applying for asylum in Mexico but decided against it, because she believes Mexican officials will simply deport her. The Mexican government says it has processed 640 migrants from the caravan seeking asylum, and is prioritizing women and children. Sandra Duarte, on the other hand, wants to ask for asylum for her and her son. But she hasn’t been able to reach Mexican officials to ask for it. She plans to keep trying. Orfa Catalina Lemos, 23, said she didn’t make enough money in Honduras to eat. She is enjoying all the donated food here in Guatemala. “If I had as much food in Honduras as I have here, I would have stayed,” she said. Still, despite the migrants’ resolve, desperation is mounting. Crowds of people gathered on the bridge to discuss whether they should try and cross into Mexico on raft. It’s a short trip — just a matter of minutes — but some had heard that the raft operators would take their money and turn them over to Mexican authorities. With no reliable information, no plan for how to cross into Mexico, and a potential public health crisis in the making, the situation on the bridge feels apt to erupt into violence at any moment. And while the caravan started with a spokesman and organizer — the former Honduran legislator Bartolo Fuentes, who was arrested in Guatemala earlier this week and deported back to Honduras — any sense of leadership here has all but evaporated. A Honduran pastor who now lives in Guatemala walked the length of the bridge Friday night, imploring people to stay calm. Some Hondurans have decided to call it quits. The journey has been too long and too hard already, and they have lost hope that they will be able to enter Mexico. Marcela Gutierrez, who had joined the caravan with her 11-year-old son, wanted to ask for asylum. She brought with her an official document from a Honduran prosecutor’s office saying she is a protected witness — she testified against her father’s murderer. But Gutierrez said she was unable to reach Mexican officials and show that paperwork. On Sunday morning, the estimated 2,000 migrants who’ve made it to Mexico set out headed north, continuing their march toward the United States from the border city of Ciudad Hidalgo. The migrant caravan is far smaller than just a few days ago, but those who remain have shown they will risk everything to continue ahead.